Vinyl flooring, which bounded into homes in the 1960s, works great in the kitchen and remains a popular choice today. Inlaid patterns are consistent throughout the thickness of the material. They last longer than those patterns printed on the top surface only (rotogravure), which can wear off. So inlaid costs more. Products differ mostly in the composition of the top, or wear, layer. The tougher and more resistant, the longer the life expectancy of the product; also, the better the warranty. Many wear layers now are impregnated with aluminium oxide and nylon. At least a dozen companies with high brand recognition provide top products. Rob Peck at Epstein Bros. Flooring praises Congoleums' Ultima line, which comes in 12-ft. widths (the old vinyl standard was 6 ft.). Material width may be a material factor in your kitchen. Ask where the seams will fall. Armstrong’s new residential flooring introductions' have added texture to colour and pattern as the third element of design,' says Deb Esbenshade, Armstrong's general manager of product styling and design. The company's recent sheet-vinyl products resemble stone, tile, concrete and even crocodile. Maintenance: There is some, but not much. As with wood floors, the culprits are outdoor grit and pebbles that are likely to scratch the finish or to become embedded. Sweep, damp mop, and follow manufacturers’ recommendations about cleaning products. What it is: a product manufactured from natural, renewable resources, including linseed oil, wood flour, ground limestone, pigments and resins, and backed by jute fiber. Its components, in combination, have both anti static and bactericidal qualities. What it is not: vinyl (PVC). Vinyl pushed linoleum aside in the 1960s because then it required waxing to keep it looking good, while vinyl didn't. Today,s linoleum doesn't need waxing because it comes pre sealed and also can be resealed. 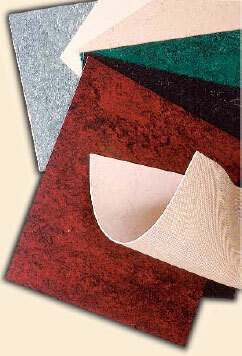 In the United States, Forbo Industries (Marmoleum) and Armstrong (Marmorette) market linoleum for residential use. Marmoleum's sheet product is 6 ft. 7 in. wide, and its tiles are 13 in. sq. The product is available in more than 150 colours/patterns and 13 borders. Or you can create your own design, to be precision-cut using water-jet technology and inlaid by the installer. Armstrong's Marmorette is produced in 6-ft. wide sheets and is available in 16 colours. Remember the phrase '... wears like iron'? It describes not only some drab garment that probably itched, but also lively linoleum. Maintenance? Be as eco friendly as the product itself, using a pH neutral cleaner. Follow manufacturers' guidelines.